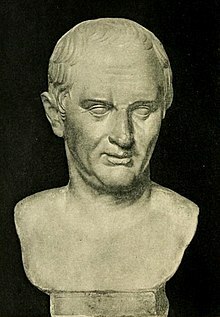 Marcus Tullius Cicero (January 3, 106 BC – December 7, 43 BC) was a speaker and leader in old Rome. "Natural ability without education has more often raised a man to glory and virtue than education without natural ability." Simple: Being able to do things because you were born that way, without learning, has more often lifted a man to greatness and goodness than learning without being born to do things. What it means: Without talent, a person cannot do great things with just learning. ↑ Peter's Quotations: Ideas for Our Time. Laurence J. Peter. Bantam Books, New York NY, USA. 1977/1979. This page was last edited on 10 June 2009, at 19:55.